Destroy blocks by making rows, columns, or diagonals of 3 or more blocks of the same color. Upper blocks will then fall down in vacated spaces. Play in SQUARE or HEXAGON mode to experience entertaining challenges. Take care of static blocks, they could block you ! Appealing high quality graphics - Play Blocks Swapper in full color. 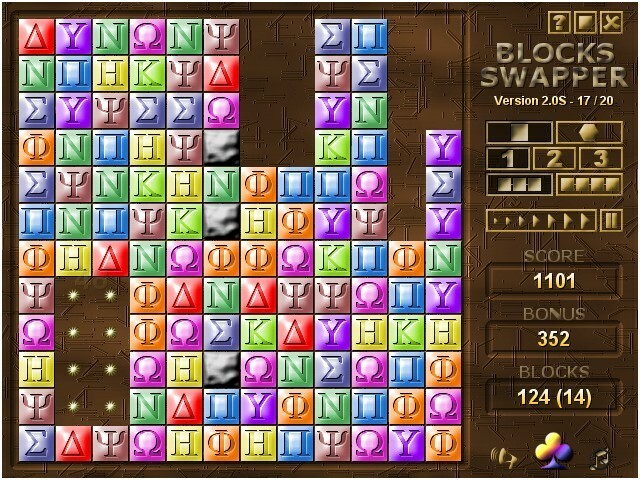 Enjoy Blocks Swapper in full size window or in windowed mode at your own discretion... Skin your game - 2M Blocks Swapper is completely customizable ! Each theme renders beautiful graphics, displays original blocks, incoporates a heap of nice effects and animations, plays entertaining musics... High quality sounds fx - Many sounds are included in 2M Blocks Swapper to enhance play enjoyment. Detailed scoring system - The faster you complete a game, the greater you score. Get bonus while destroying large number of blocks. Keep track of best scores and statistics... Online help - A detailed documentation will teach you every aspect of 2M Blocks Swapper. Rules are fully explained. Edraw Max - Easy to create flow chart, org chart, business chart, mind map, calendar, family tree, gantt chart, project management, business form, timeline, bpmn, UML diagrams, workflow, building plan, science illustration, network diagram and map. Hangman Pro for the Macintosh - Hangman Pro is a modern take on the classic hangman word-guessing game. It features colorful, non-violent graphics, digitized sounds, dozens of built-in word categories, thousands of words, unlimited custom lists, timed games and photo fun. Flowers Popper for Android - Match colorful flowers to remove them and free space for new ones. To remove flowers from the grass, get a group of 3 or more assembled in vertical or horizontal line. 3DSwapBalls - The object of the game is to score as many points as possible by swapping adjacent gems to create sets, either horizontal or vertical, of 3 or more identical gems. Sets can be horizontal or vertical, and can contain more than 3 gems. 3DJongPuzzle - 3DJongPuzzle is the mah jongg - like tile solitaire game for Windows. It is a fun tile matching game, that tests your mind. The goal of 3DJongPuzzle is to remove all of the tiles from the game board. Tiles can be removed only in pairs of free tiles. Clickris - Clickris is arcade-style puzzle game for Windows.The goal of game is to get as much points as you can by removing stones from game field. You can remove groups by clicking on them of stones with the same picture, but not on isolated stones. PuzzleJig - PuzzleJig is the jigsaw puzzle game for Windows. You can choose any number of pieces, with or without rotation and create puzzle from bitmap and jpeg files.Features include load and save the game, resizable window of puzzles and help with solving. JongPuzzle - JongPuzzle is the mah jongg - like tile solitaire game for Windows.The goal of JongPuzzle is to remove all of the tiles from the game board. Tiles can be removed only in pairs and must have at least one free side. 15Slide - 15Slide is a computer slide- puzzle game. It's an advanced version of the well-known 15 puzzle. To solve the puzzle you have to original order of randomly shuffled numbered pieces in the least moves possiblen by sliding pieces into the empty spot.